We’re in the business of building the “whole child” by helping campers grow in character, relationships, skills and faith. New Bethel Christian Church Summer Camp is a magical and memorable time of new friends, discoveries and growth. Since 2015, NBCC Summer Camp has been shaping the lives of children in creative, fun and nurturing ways. 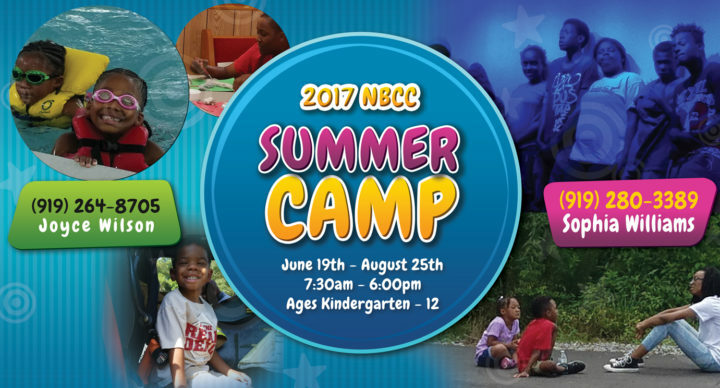 The NBCC Summer Camp program nestled in Raleigh, North Carolina. While our campers come to NBCC excited about all the fun and adventure they’ll have, our parents send them knowing all the skills they’ll develop. If you are sending your child to camp for the first time, we understand the hesitation that comes with letting a child go from sunup to sundown. We also long for our children to be safe, to belong and thrive. That’s what NBCC is all about. We hope you enjoy our website and please give us a call so we can tell you more about our program.